The program relaunched June 2 and has almost 30 swimmers enrolled. The long-awaited relaunch of the Plant City Family YMCA’s swimming team has gone better than expected. Kids enrolled in the Plant City Family YMCA’s swim team learn the four basic competitive strokes. 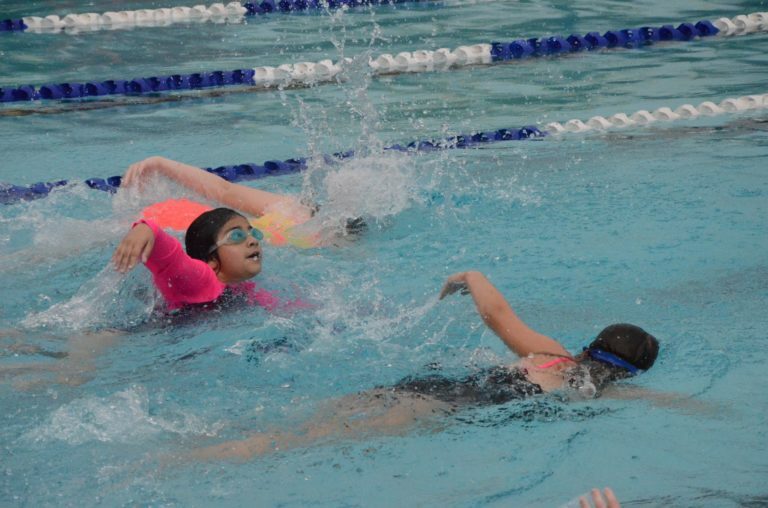 Since the developmental team’s season began June 2, the Y has seen a steady increase in participation and now trains a group of 26 young swimmers three times each week. Though tryouts initially ended in late May, the community’s response has been so strong that the Y has allowed kids to try out and enroll throughout the season. “I think that the response from the community has been fantastic,” Aquatics Director Maggie Cattell says. Lifeguard and swimming instructor Shannon Yagins was tapped to coach the team in April. Yagins, who swam competitively while at Plant City High School, is tasked with teaching kids the four competitive strokes — freestyle, butterfly, backstroke and breaststroke — as well as flips, starts and other fundamentals. The first-time coach enjoys learning as she goes, just as her swimmers do. Coach Shannon Yagins runs practices three times each week. The primary goal of the program is to help kids decide for themselves whether competitive swimming is something they’ll want to do in the future. That means the team also goes beyond simple lessons and puts the kids in competition situations. Each month, the swim team will attend meets with other YMCA developmental programs. First up is a meet Friday at the Northwest Family YMCA in Tampa. For next month, the Plant City Y has been granted a meet of its own. That one, scheduled for July 28, is expected to draw a larger turnout than the facility is used to, even when hosting high school meets. In the meantime, the Y’s goals are to maintain participation numbers and preserve open lanes for members who wish to swim at the same time. “We want to respect members’ wishes,” Hilferding says. Cattell says a parents’ orientation meeting is being planned for the near future to communicate further with the families. One concern Cattell and the program are preparing for is that, should enrollment keep trending upward, Yagins could need another coach to help run practices. Cattell said the process is in the works, though finding someone with the appropriate amount of experience may not be quick. “We want to make sure that kids are getting a lot of attention from the coach and that they’re getting a lot of space to grow and develop,” Cattell said.